4Videosoft iPad 3 Manager Platinum 6.1.22 無料ダウンロード - Transfer files between iPad 3 and PC, convert DVD/Video to iPad 3. 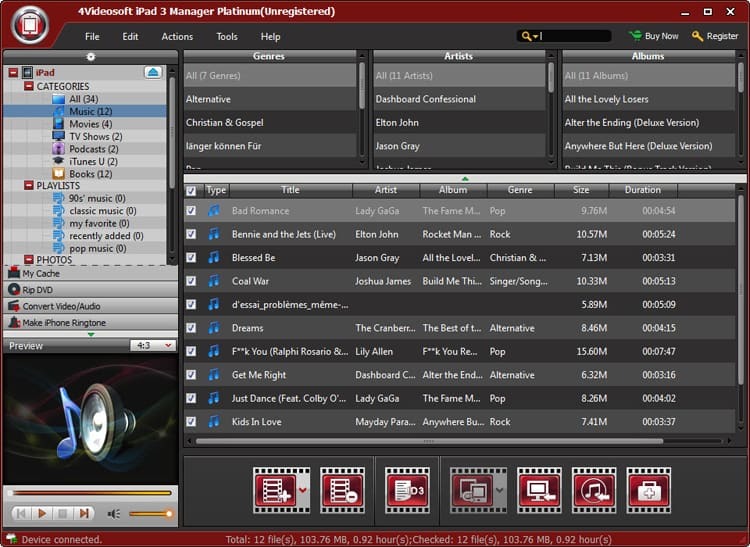 4Videosoft iPad 3 Manager Platinum can transfer various files like music, movie, photos, camera roll, camera shot between iPad 3 and computer freely. It can also transfer TV shows, Podcast, iTunes U, eBooks, ePub, voice memos, SMS (MMS) and contacts for iPad 3. Besides, it can convert DVD and video files to iPad 3 as well. There are some powerful editing features: trim, crop, watermark, effect, etc. Plus, it newly supports iOS 6 and iPhone 5 and adds the function of digital signature, iMessage and contacts. 4Videosoft iPad 3 Manager allows you to transfer all files from iPad 3 to computer and iTunes directly without losing. Besides, you can import computer local files to iPad 3 easily. What's more, this iPad 3 transfer software can help you transfer files among all Apple devices. It highly supports all iPad, iPhone and iPod versions. The iPad 3 Manager can help you convert any DVD and popular video file to the iPad3, supported MP4, MOV, MP3, WMA, etc. Besides, the features of this iPad 3 transfer software can help you optimize the output video effect: trim, crop, merge, watermark, adjust brightness, contrast, saturation, volume and hue, and so on. What's more, it allows you to make iPhone ringtone from DVD, video and audio files you select without time-length limitation. You can store the converted files to My Cache at first and transfer them to iPad 3 later. This iPad 3 transfer can present all information of your iPad 3 on the interface, including picture, type, capacity, version number, serial number and format, etc. Besides, the "Search" function can help you find your files by categories of Genre, Artist, and Album. You can edit the ID3 information of iPad 3 files freely: name, artist, album, track number, lyrics, album cover, etc.